A new rechargeable battery technology could double the output of current lithium ion cells, an advance that promises to extend electric vehicle ranges and the time between mobile phone charges. By using a ceramic, solid-state electrolyte, engineers at the University of Michigan have harnessed the power of lithium metal batteries without the historic issues of poor durability and short-circuiting. Their breakthrough could lead to longer-lasting drop-in replacements for lithium ion batteries. 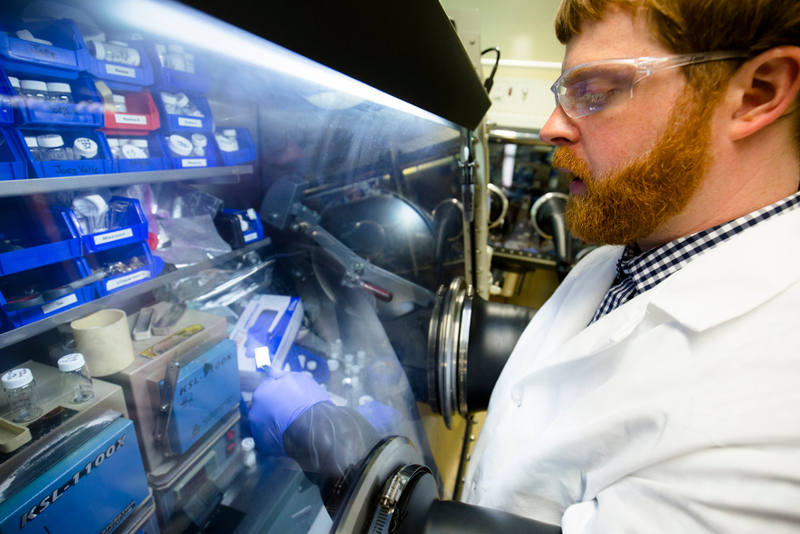 “This could be a game-changer – a paradigm shift in how a battery operates,” said Jeff Sakamoto, a U-M associate professor of mechanical engineering who led the work. The first rechargeable lithium metal batteries contained combustible liquid electrolytes. Furthermore, lithium atoms that moved between the electrodes tended to build dendrites on the electrode surfaces, eventually shorting the battery and igniting the electrolyte. Lithium ion batteries followed, replacing lithium metal with graphite anodes, which absorb the lithium and prevent dendrites from forming. This increased safety at the cost of energy density. According to U-M, graphite anodes in lithium ion batteries hold one lithium ion for every six carbon atoms, giving it a specific capacity of approximately 350mAh/g. The lithium metal in a solid-state battery has a specific capacity of 3,800mAh/g. Current lithium ion batteries have a total energy density around 600Wh/L at the cell level. In principle, solid-state batteries can reach 1,200Wh/L. To solve lithium metal’s combustion problem, U-M engineers created a ceramic layer that stabilises the surface by preventing the build-up of dendrites, which allows batteries to harness the energy density and high-conductivity of lithium metal without the inherent dangers of fire or degradation over time. In earlier solid-state electrolyte tests, lithium metal grew through the ceramic electrolyte at low charging rates, causing a short circuit. U-M researchers are said to have overcome this with chemical and mechanical treatments that provide a pristine surface for lithium to plate evenly, effectively suppressing the formation of dendrites or filaments. Not only does this improve safety, it enables a dramatic improvement in charging rates, Sakamoto said. “Up until now, the rates at which you could plate lithium would mean you’d have to charge a lithium metal car battery over 20 to 50 hours [for full power],” Sakamoto said. “With this breakthrough, we demonstrated we can charge the battery in three hours or less. Repeatedly exchanging ions between the cathode and anode produces visible degradation. In tests on the ceramic electrolyte no visible degradation was observed after long term cycling. The group’s findings are published in the Journal of Power Sources. Mixing units in an unexplained way again! One sentence refers to energy density per unit mass, and then another in density per unit volume (incorrectly shown with a capital L). To correlate the two we need to know the density of the new medium. Then the comparisons have some meaning. But aside from being pedantic it looks very promising. Though charging a battery in a shorter time means transferring the same energy over that shorter time exacerbating supply and distribution issues. Pity that wider effort is not being made to improve the charging infrastructure. Hi Nick….One was comparing like for like (energy density per gram Li in different chemistry) and the other talking about the volume capabilities possible in use…for real-world (‘scuse the pun) potential…no issue (other than the capital “L”). This has great potential…long term reusable,non degrading batteries with a far-higher energy density per gram of lithium (cheaper) and capacity per litre volume (energy density)…the 1000mile electric car is just around the corner…and electric flight suddenly starts to look realistic! This is all very interesting, but there is no mention if the solid-state electrolyte will reduce the cost per kWh of battery packs.